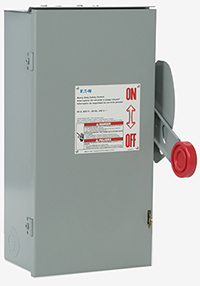 Eaton manufactured 30A and 60A heavy duty safety switch which may contain a component non-conformance. Please complete the form below to provide the results of your on-site inspection and request your replacement component. Download safety bulletin for more information. Our team of experts will be in touch with you after required information is received. Qty Identified within Date Range (11/19/15 – 1/23/18) * Please list quantity of each catalog number listed above, with each separated by a comma. Please be sure quantities are in the same order as the catalog numbers above. Please keep the same order as the catalog numbers. Example: If there are 5 of the first catalog number, list those 5 date codes, comma-separated, then the quantity for the next set of date codes, etc. Qty Identified within Date Range (11/19/15 – 1/23/18) Please list quantity of each catalog number listed above, with each separated by a comma. Please be sure quantities are in the same order as the catalog numbers above.